2.double walls, thickness of outer plate: 1.5mm, thickness of inner plate: 0.8mm, with heat insulation between two walls. (4) Material: galvanized steel; double walls, thickness of outer plate: 1.5mm, thickness of inner plate: 0.8mm, with heat insulation between two walls. The cabinet is made of galvanized steel, with double walls, thickness of outer plate: 1.5mm, thickness of inner plate: 0.8mm. There are heat insulation between inner wall and outer wall. The insulation material is 40mm PEF, heat insulation coefficient: 0.035W/m·K. The cabinet is assembled type. The cabinet includes 19” equipment installation rack. The cabinet includes two air conditioners, one installed on front door and another installed on back door. The cabinet includes one front door and one back door. The cabinet door uses embedded structure. The door opening angle is larger than 110°and the door limit device can limit the opening angle. The lock is theftproof three point lock, supporting padlock. Each cabinet door include open door sensor, working together with the environment monitoring unit. 4.3 Including -48VDC illumination LED lamp. 4.5 The layout of the cabinet is reasonable, which will facilitate cable access, fixing and grounding. At the bottom of the cabinet, there are cable inlets separately for power cable, signal cable and optical cable. 4.7 The cabinet includes 19” standard installation rack. Insulation resistance: the insulation resistance between grounding devices and cabinet body parts is not lower than 2×104M/500V(DC). Mechanical strength: each surface can bear upright pressure >980N; after the door is open, its outer end can bear upright pressure >200N. Cabinet External Dimension (W×D×H): 1000×1000×1800mm. 6.1 LED lamp, LED lamp sensor, smoke sensor, door sensor and temperature & humidity sensor are installed at the top of the cabinet. 6.3 PDU and environment monitoring unit are installed on 19” rack. 6.4 The cabinet includes totally two air conditioners, one air conditioner installed on front door and the other installed on back door. 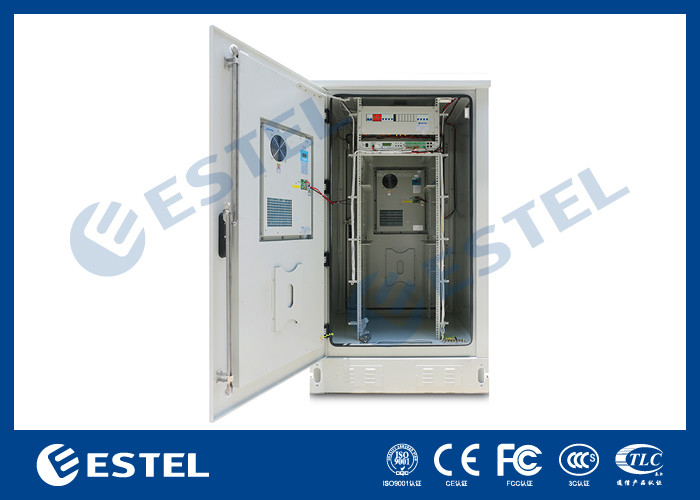 6.5 The cabinet includes rubber base plate, for installation on transport telecom tower trailer. 10.2 Users prefabricate concrete base. 10.3 Pre-embed 4pcs M10×120 anchor bolts on the concrete base. Distance between bolts are as that in diagram 1. Bolt exposed height is 40mm. Put the cabinet on the concrete base, align anchor bolts, then screw on nuts, and tighten them with wrench. 10.4 According to site situation, put the cabinet on the concrete base with forklift, crane or manually, and fix it on the concrete base with bolts. Quantity: 2 pcs air conditioners for each cabinet, one installed on front door and the other installed on rear door. (2) Working Principle: the cabinet includes auto switching controller for the two air conditioners. Air conditioner 1 is main air conditioner, and air conditioner 2 is backup air conditioner. Air conditioner 1 will keep working if there is no failure and alarm; only in case air conditioner 1 send failure alarm, air conditioner 2 will start to work, and air conditioner 1 will stop working.